Cao Wenxuan, illus. Meilo So, trans. Helen Wang, London: Walker Books, pb. 978 1 4063 4846 0, 2015, £6.99, 400pp. First published in China 2005. This book was the winner of the Marsh Award 2017 and Cao Wenxuan was the winner of the 2016 Hans Andersen author award. This book was included in the Hans Andersen citation. Although this book, by one of China’s leading academics and writers for children, was published more than ten years ago, it was presumably not until an English translation was available that it could be read widely enough to receive the plaudits of an international readership. There is little doubt that adult readers too will be struck by the vivid way in which the rural Chinese landscape is evoked and have their mental horizons enriched by an imaginative awareness of the impact of the 1960s Cultural Revolution on both villagers and city people. In the novel, these two cultures are brought together by the establishment in the countryside of a ‘cadre school’, where educated people from the cities have to combine hard physical labour with attendance at political meetings. 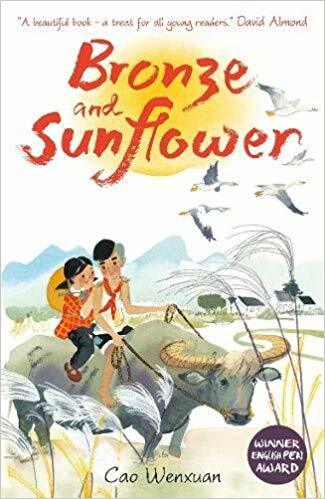 Sunflower, ‘a quiet, gentle little girl’, has lost her mother, and when her father, an artist famous for his bronze sunflowers, is drowned in the river that separates the cadre school from a local village, Damaidi, she is consigned to the care of a poor village family. The children are brought together by their shared care for the family buffalo and their love of the fields of sunflowers that surround the village. Most of the book is devoted to the relationship between her and the son, Bronze, who has been mute since a disastrous fire when he was five (though he is able to communicate with his family by means of hand gestures and the expressions of his eyes). The children are brought together by their shared care for the family buffalo and their love of the fields of sunflowers that surround the village. Bronze is committed to Sunflower’s attendance at the village school; the family’s poverty and his muteness have proved obstacles to his going there, but he learns to read as a result of Sunflower’s tuition. The ensuing crises highlight the precarious reliance of the villagers on the rice harvest and the devastating impact of a swarm of locusts. The figures of the children could be seen as metonymic of the division between the traditional way of life and the impact on it of the new educated class; this is perhaps especially powerful because of Bronze’s muteness. The implicit question about how long their relationship can last, latent throughout the book, comes to the surface at the end. Opinions may differ as to how successfully Cao Wenxuan resolves it. The translation is fluent, though I did feel that the provision of a map would have facilitated my understanding of the locations. I think that readers would have few reservations in agreeing with David Almond’s comment about the beauty of the book, nor with his assertion at the end that ‘Our children need to be exposed to a world of voices so that the whole world becomes their home.’ The voices in Bronze and Sunflower certainly make the world of rural China present to us in a unique way.